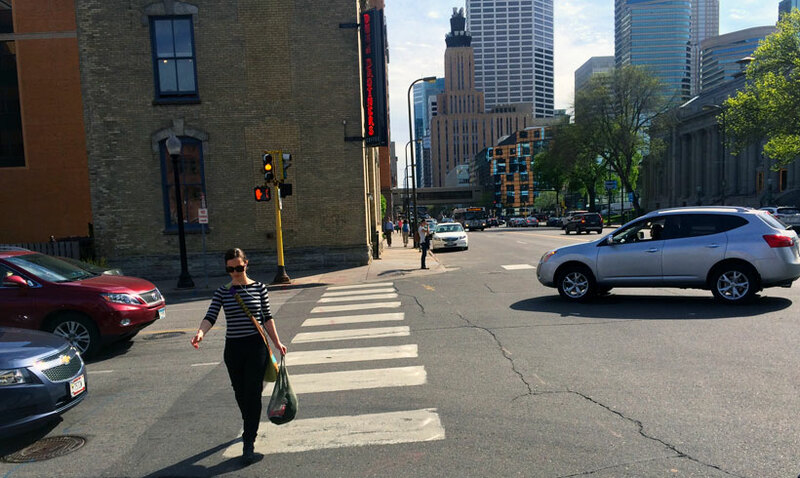 In 2015, Transit for Livable Communities and a small team of allies successfully championed a new state law expected to improve safety for people bicycling and walking in Minnesota. The new law called for updating road design standards used in communities all across the state. Specifically, it initiated a process for aligning the State Aid standards cities and counties use with the design standards used by the Minnesota Department of Transportation. As we wrote at the time, change is good. These design standards play a big role in determining what our streets look like, and that in turn influences transportation choices and safety. MnDOT’s standards are more flexible, allowing designers to fit the needs of all modes when space is limited. And that means more streets designed to work for everyone, not just for cars. After a year-long, statewide review process, MnDOT has issued their recommendations for changes to the State Aid standards. As part of that process, TLC’s executive director Jessica Treat served on the Transportation System Users Steering Committee alongside Craig Churchward, Transportation Landscape Architect with Michael Baker International in Minneapolis. Recently, we caught up with Craig to get his perspective on the outcome. TLC: You were among the voices calling for changes to the State Aid standards last year. Why? CC: County and municipal roadways are a critical component of our state’s transportation system. Our investment in local roadways must ensure safety, mobility, and access for all modes of travel. I had witnessed the frustration of local authorities not having the flexibility they needed to be responsive to the needs of their communities—that frequently local roadways were being designed to standards for motor vehicles that were above those needed only for safety or efficiency. Frequently the application of these standards adversely impacted the ability of bicyclists and pedestrians to use the local street, and also adversely impacted the community’s social cohesion and economic vitality. The cost of these facilities (and the cost of their adverse impacts) was not only an unfair burden on taxpayers; it limited the ability of officials to improve more miles of roadway within their communities and to adequately provide for pedestrians and bicyclists. TLC: How would you describe the committee’s task or role in the review process? CC: Our committee’s responsibility was to ensure that the intent of the legislation was being followed—that the design flexibility MnDOT employs on the state’s Trunk Highway System be applied to the state’s County and Municipal State Aid System. MnDOT deserves credit not only for listening to the concerns that generated the legislation but also for allowing our committee to have significant influence on the final product that was produced. TLC: What key recommendations came out of the review process? What are you most excited about? CC: I am most excited about the flexibility that county and municipal roadway designers will now have in determining the cross-section of a roadway, particularly the ability to right-size the widths of driving and parking lanes as a function of traffic volumes and speeds without hindering vehicular safety or efficiency. Giving designers the flexibility they need in order to balance modes and provide adequate space not only for cars, buses, and trucks, but also for bicyclists and pedestrians, is a substantial improvement. TLC: In your view, what are the potential benefits or implications for transportation projects in Minnesota generally? CC: Making roadways responsive to local needs is the major benefit of this legislation. Citizens and local authorities have never forgotten that roadways are really tools for creating community and commerce, not merely pipes for moving cars. It’s the people inside the cars, buses, and trucks and the people bicycling in the street or walking on the sidewalk that generate society and economic activity. We are all of those people—we drive to work, we bike to a park, we walk to a friend’s house. Regardless of the mode we use, they are just a means to an end—the end is society. The vibrancy of our communities, their social cohesion and economic vitality, are critical to our personal health and our nation’s well-being. The flexibility outlined in MnDOT’s report to the legislature will give us the design flexibility we need to make our state’s roadways more responsive to these general goals. TLC: Could changes to these design standards lead to a greater emphasis on Complete Streets? CC: This is the exciting part, by freeing up space and money that was previously only available to move cars, we will have the opportunity to make sidewalks more inviting and bicycle facilities more prevalent. If done correctly (and the suggested new standards allow the design to be done correctly), the reallocation of space from motor vehicles to pedestrians and bicyclists can be done for the same cost (or less) than we were spending on unused and unneeded lane width. The money saved means that more miles of roadway could be reconditioned each year without raising additional revenue. TLC: If/when the recommendations are adopted, how would that bring Minnesota in line with other states? CC: The adoption of design standards for State Aid roadways that are essentially the same as the more flexible standards used on state and national roadways, will bring our local roads into better alignment with the design practices of other states. Nonetheless, Minnesota will remain unique, and frankly we pride ourselves on that uniqueness. However, it appears, from what I’ve been able to discover, that we are the only state that has design standards as part of its legislative rule-making process. This makes it difficult to adapt to ongoing changes in transportation—it literally takes an act of the legislature to make significant changes to State Aid standards. If other states have moved the creation of design standards to an administrative level of government (with, of course, legislative oversight), why can’t Minnesota move in that more responsive direction? TLC: What are the next steps now that the committee’s report has been issued? CC: MnDOT is examining some of its internal procedures related to how counties and municipalities apply for design variances. Currently the process of reviewing requests for a design variance has been considered too lengthy and cumbersome by many local officials. Hopefully, MnDOT’s assessment of its design variance procedures will reach out to those who have had issues with the process and new streamlined procedures will be adopted soon. TLC: The committee’s letter to MnDOT asserts, “This alignment of standards, however, is only a beginning. Fully integrating pedestrians, bicycles, and transit into the planning and design of our state’s transportation network will require much additional effort.” From your perspective, what should be at the top of that to-do list for continued progress on multimodal options and streets that work for everyone? CC: All of the states surrounding Minnesota have a lower statutory minimum speed limit—the lowest speed that a community can post on most of its roadways. In Minnesota, the statutory minimum is 30 mph. It is 20 or 25 mph in the states surrounding us. The chance of a pedestrian being killed when hit at 30 mph is significantly greater than if they were hit at 20 mph. Most local streets in residential areas, where the distance traveled is measured in blocks, do not need to have a 30 mph speed limit. Local streets can be part of a neighborhood’s public realm—where neighbors meet and talk, kids play, and, yes, where cars move. And they can do so together—but only if the vehicular speeds are much lower than 30 mph. Why not give local communities the ability to decide for themselves the speed of their roadways and, subsequently, the character of their neighborhoods? Personally, I’d like to see the statutory minimum completely removed from law for municipal streets or at least lowered to 20, or maybe even 15 mph.